Leah Banana Clip ~ High quality hair at a price you definitely can afford. 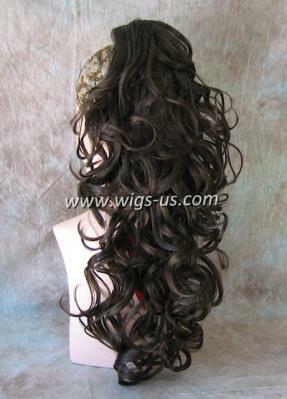 The Leah hairpiece offers an easier alternative to having to wear a full cap wig. Instead of all that work, lets make it easier by owning this attachable hairpiece. All you have to do is put your hair up, and attach the Leah with a banana clip. These clips are very easy to attach in the hair, and won't take much time at all. Now you can look great in an instant. Forget about sitting in front of the mirror every time you need a fashionable look. The Leah style reaches down to the shoulder, and is a layered, wavy look. Perfect when you want to draw attention to yourself in a subtle, beautiful way. No one is going to even notice you're wearing anything extra. Especially since we have a large variety of colors for you to choose from. Matching the exact color to your own is easier then you think. At this price, we don't expect the Leah to last much longer. Add it to your cart today, and remain regret free after wearing it on for the first time.